Rob Kiser|Call Photo Lehman Catholic’s Angela Brunner hits a backhand return as Sarah Gibson is in position at the net during the sectional tournament this week. TIPP CITY — One thing Lehman Catholic girls tennis coach Tim Ungericht can do is keep a secret. But, after his doubles team of senior Sarah Gibson and junior Angela Brunner returned to the Schroeder Tennis Center to finish off a suspended match with Northwestern’s Leah Dotson and Allex Smith to determine who would advance to the D-II district tournament and won convincingly 6-3, 4-6, 6-0, he knew it was time to let the girls in on the secret. And their reaction told the story, as they both got big smiles on their faces and began celebrating. Brunner was equally surprised that Saturday’s semifinals and finals are only for seeding at district — they are officially Lehman girls tennis first district qualifiers since Julia Harrelson in 2013. “I thought we had two or three matches, whatever it is on Saturday — and I thought we would have to win all those matches to get to district,” Brunner said. And it was a culmination of Ungericht’s plan. The girls weren’t as easily convinced. 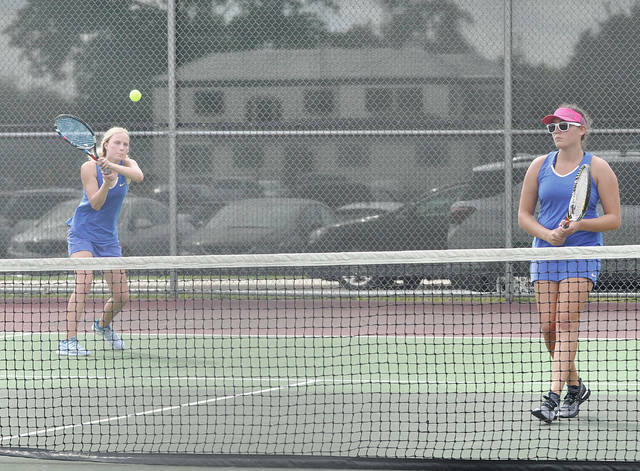 But the duo, who played second and third singles for Lehman during the season, received the fourth seed and everything seemed to be on track until Mother Nature intervened Tuesday. After a first-round bye, they had beaten Camillah Jones and Claire Wint of Tippecanoe 6-0, 6-4. Then, they won the first four games against Dotson and Smith and were up 5-1 before a rain delay. After a short break they held on to the first set 6-3, but then storms forced a move to Schroeder’s. They were down 2-0 at the time and lost the second set 6-4. With no time to play a third set, they returned Wednesday to decide it. While Lehman had a match Wednesday in the afternoon, most of the varsity players did not participate. And when they took the court at Schroeder’s, they looked like the same team that had opened a 4-0 lead on Tuesday. They got a break point in the opening game of the third set when Brunner drilled a passing shot down the doubles lane — then Gibson had a forehand winner on her return of serve at break point. “That was huge to get the break right away,” Ungericht said. Then, Gibson held her serve at love in the second game to make it 2-0. “Angela (Brunner) hit four perfect volleys in row there on Sarah’s (Gibson) serve,” Ungericht said. Still, the pivotal game may have been with Brunner serving at 3-0. Not, that it came easy. Bruner faced two break points before holding her serve. Two games later, Lehman was headed to district. “I don’t know if I expected it, but now I get to go to district with best friend,” Gibson said with a smile and a hug. It brought back memories for Ungericht as team prepares for Saturday morning’s semifinal match with Milton-Union’s Meredith Fitch and Hannah Fugate — top seed. “It was 30 years ago,” Ungericht said. “Chad (New) and I were playing a match to go to district. Just like them, we were the second and third singles players. It was the same situation, we lost the second set and had to play a third set, even though we should have beaten them easy. https://www.dailycall.com/wp-content/uploads/sites/30/2018/10/web1_doubles.jpgRob Kiser|Call Photo Lehman Catholic’s Angela Brunner hits a backhand return as Sarah Gibson is in position at the net during the sectional tournament this week.